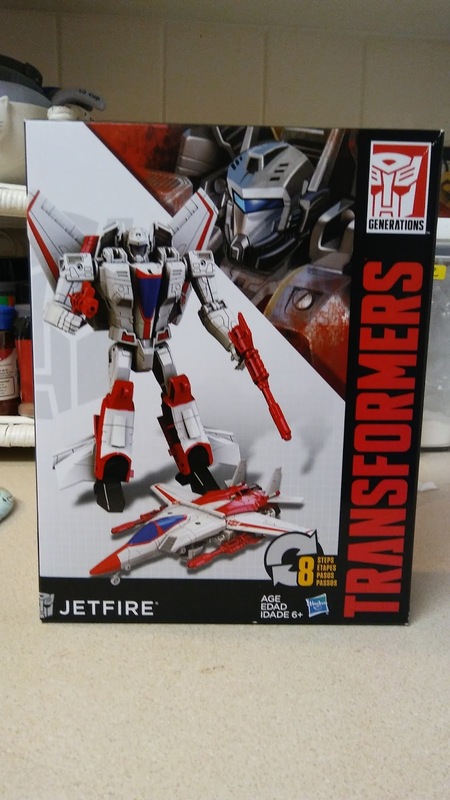 Jetfire is one of those Transformers characters that is near iconic, but just below the obvious choices when people name off Transformers characters. For me he was always something awesome. There's a near Boba Fett level of intrigue to his name. Something that just can't be put into words, but right there in the mojo. When the Cyber Battalion line released a version of him, I knew I had to have one. Fortunately the series has recently become available here in the US sold in Walgreen's stores for much less than can be found online. It's worth noting that there is a few available at Universal Studios, but not fair to compare the prices as that's at a theme park and sold as an exclusive to those parks here in the states (though I wonder how much longer as the Optimus and Bumblebee are available in Walgreen's now sans the Universal Studios label on the boxes). But essentially, you can now get these great figures much easier and cheaper at your local Walgreen's. 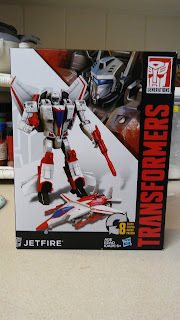 Jetfire is a remold and redeco of the Starscream that I've went over here before , so I won't have to much else to go over with him other than how great looking he is. Man these colors really look good on him. Something about that basic set of colors just really work on a jet. With the new head molding, it almost seems like this toy was always intended to be Jetfire. While Starscream was great in his own right, Jetfire just seems more natural. These Cyber Battalion figures are a simple joy to be held. Not very complicated and possessing a very limited amount of articulation, they are basically giant legion figures and that's where their charm is. This is a big toy. Roughly voyager scaled. Sure, you can'y put him in an Ironman pose and take 5 million high def photos of him doing an Ironman pose in your fancy glass display case while using hashtags like #dope. But what you can do is open a big box full of solid chunky jet robot toy and probably throw him through a wall. I don't advise you do that, but it'd probably hurt the wall worse than the toy. Not to mention, it's just very satisfying to just fiddle with and pretty impressive to look at. While I imagine the upcoming Authentics discount line will eventually take the place of these, these are the perfect toys to sell at a store like Walgreen's or a Family Dollar. I'm not going to try and convince you to go out and buy one if you don't want one. But I'm guessing if you read Zone Base, then you probably enjoy Transformers in a similar way to me and this is something you'd enjoy a lot.